Companies like EatOffBeat and Hot Bread Kitchen are helping resettled immigrants bring the flavors of their nations to U.S. menus. In a kitchen in Queens, New York, a chef named Dhuha is making potato kibbeh—Middle Eastern croquettes made with ground beef—that the women in her family taught her how to shape just so. Dhuha, who grew up in Baghdad, works at Eat OffBeat, a food delivery business that provides home-style meals prepared by refugees resettled in New York City. Life as an immigrant brings a host of challenges that arise from adapting to a new country, culture, language, diet, and workforce. And it’s an increasingly common situation: A 2016 United Nations report found that 1 in every 113 people in the world is now either internally displaced, an asylum-seeker or a refugee. During the fiscal year 2016, 84,994 refugees resettled in the U.S. and 5,028 of them moved to New York State. Programs like Eat OffBeat aim to help these women land on their feet. And they’re not alone: The philosophy of the group has taken root in other parts of the world as well. 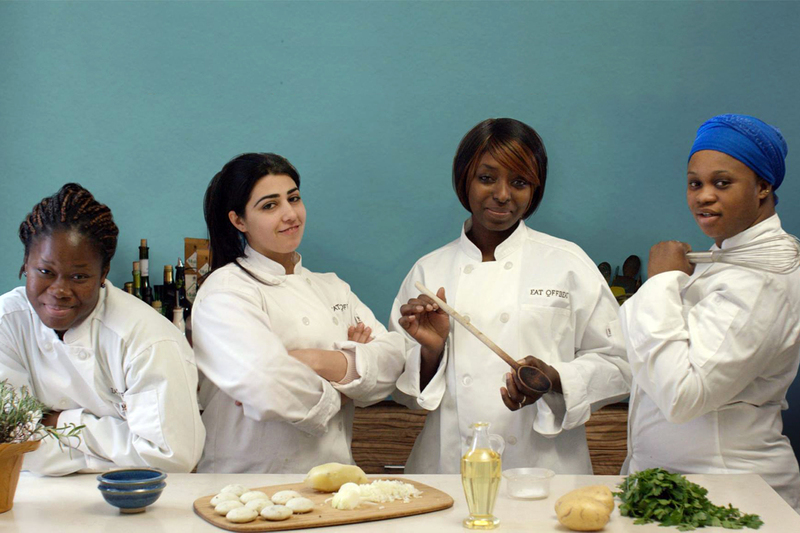 In London, for instance, Mazi Mas hires women from migrant and refugee communities as chefs. In Paris, Les Cuistots Migrateurs employs refugee caterers. And at Hot Bread Kitchen, just 40 minutes south in East Harlem, women with low-income status, most of them immigrants who hail from diverse backgrounds ranging from Turkey to Ethiopia, participate in a six-month-long program designed to teach them how to make a variety of breads from around the world. Springboard to Life in the U.S. While each of Eat OffBeat’s all-female chefs—who hail from Nepal, Syria, Eritrea, and Guinea-Conakry—learns how to prepare the others’ recipes, each has specialties and favorites. In fact, it was co-founder Manal Kahi’s hummus recipe that inspired her and her brother Wissam to start the organization, shortly after she arrived in New York from Lebanon in 2013. When her family recipe was a hit among her friends in New York, the siblings decided to seek out other refugees who could prepare authentic dishes from the regions they left behind. After teaming up with chef Juan Suarez de Lezo, who as chief culinary officer trains the chefs to cook and cooperate in a professional kitchen, Eat OffBeat launched in 2015. Manal said Eat OffBeat’s full-time employees can support their families and its part-time employees have extra income and flexible schedules that allow them to take care of other responsibilities. “Many of the chefs had never worked in the U.S., or anywhere, prior to coming to Eat Offbeat, so this first job is a jumping board,” she said. She added that, if you’re passionate about cooking, it’s relatively easy to get a job with Eat OffBeat and gain crucial work experience. The organization strives to spread “a more positive story and somewhat rebrand the word ‘refugee,’ highlighting all the value that this community actually brings,” says Manal. And she hopes some of the chefs will go on to start their own restaurants or businesses. But the delivery business doesn’t just see its chefs as refugees; it also hopes to reveal them as unique, valuable individuals. Some customers discover Eat OffBeat with a specific desire to help local refugees, but Manal says they come back for the food. “We always emphasize that our cooks are refugees by status, but chefs by nature,” she told Food & Wine. Nafissatou, a Hot Bread Kitchen baker-in-training who emigrated from Burkina Faso, knows all too well the challenge of finding a new occupation in an unfamiliar land. After waiting in vain for call-backs after multiple job interviews, a friend told her about Hot Bread Kitchen. Making m’smen at Hot Bread Kitchen. Manal Kahi’s favorite Eat OffBeat meal is the edamame salad, made with edamame, shredded cabbage, tomatoes, and spices from both Nepal and Syria; she sees it as an excellent metaphor for the unique gifts and unexpected pleasing combinations that are characteristic of diverse communities. Born of two different salads from two Eat OffBeat chefs—engaged in a friendly competition to make the best dish—Kahi said everyone realized that the best outcome was when they mixed both together. In 2017, the Trump administration’s rhetoric and actions created additional challenges for immigrants and refugees living in or coming to the U.S. After taking office in January, President Trump signed executive orders expanding the authority of immigration officers. By May 2017, U.S. Immigration and Customs Enforcement (ICE) arrests had climbed almost 40 percent over the previous year. And a modified version of the travel ban that Trump has been trying to institute since his first month in office went into partial effect at the end of last month. “The environment in general has become much harder for immigrants and women in the restaurant industry” under the Trump industry, said Saru Jayaraman, co-director and co-founder of Restaurant Opportunities Centers (ROC) United, which works through a variety of justice campaigns to improve the wages and working conditions of the U.S. restaurant workforce. “Immigrants in the restaurant industry feel a great deal of fear since the election, and it was already hard for women in this very male-dominated industry,” she added. At the same time, “Immigrants in the industry are being extremely courageous and speaking up in a number of ways—marches, rallies, and programs, like our own Sanctuary Restaurants,” Jayaraman said, referring to the project launched by ROC United and Presente.org, a Latinx empowerment movement, that promotes and connects diverse, safe, and inclusive restaurants. “In some ways, the extremely challenging moment could also be an opportunity to change an industry that already posed incredible barriers to immigrants and female chefs long before the election,” Jayaraman said.